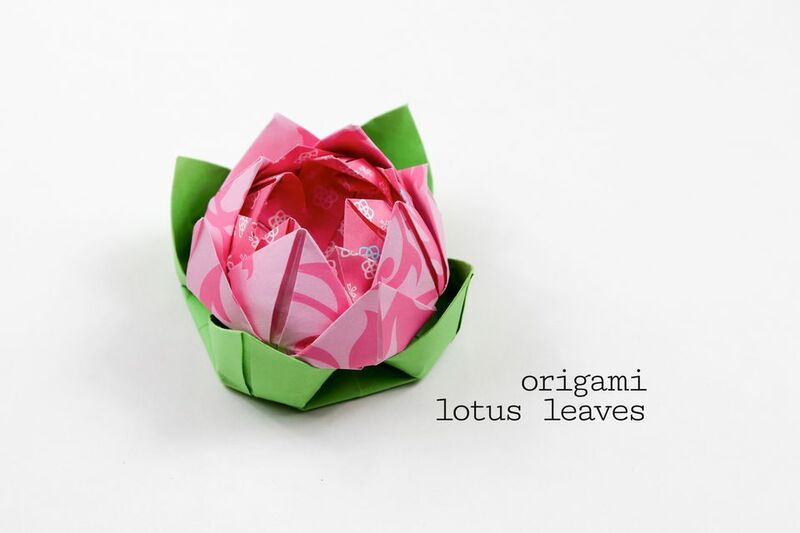 Make some pretty origami leaves for your lotus flower to sit on! These origami lotus leaves are similar to the lotus itself, quick and easy to make! You can also use these leaves on their own as little flowers. Or use them as leaves for other types of origami flowers such as the kawasaki rose. For an 'all in one' lotus and leaf option, check out my modular origami lotus tutorial. You will need one sheet of square and preferably green paper. Use paper that is thin but sturdy for the best result. This origami tutorial was requested by a subscriber on my youtube channel, so let me know if you'd like to learn something in particular by either commenting on one of my videos or contacting me through my website. 1. Start with paper that is smaller than the paper you used to make the lotus. The paper I used for the lotus was 20 x 20 cm. The paper I'm using for the leaf is 15 x 15 cm. To work out what size to use, take the width of your paper that you're using for the lotus and divide ÷ by 1.33. The result will be the size to use for the leaf. 2. Starting white side up, fold the paper in half diagonally in both directions and unfold. 3. Fold all 4 corner to the middle. 4. This is what you should have. 5. Again, fold all 4 corners to the middle. 6. This is what you should now have. 7. Flip the paper over to the other side. 8. Fold all 4 corner to the middle. 9. This is what you should have. 10. Fold all 4 corners in a little bit as shown. 11. This is what it looks like on the other side. 12. Pinch the paper as shown, holding the little flap under your index finger and your thumb under the 'petal'. 13. Gently but firmly pull the petal up and over (not outwards). Be careful you might rip the paper. 14. Repeat this for the other 3 leaves. 15. The leaves are finished. 16. Now you pop your lotus on top! Make the lotus: Easy Origami Lotus Tutorial!